Carl Hollis, Sr., age 81, passed away at St. Bernards Medical Center on March 16, 2019. He was born on August 2, 1937 in the hollers of Lawrence County, TN to Thomas and Blanche Hollis. Carl Sr. proudly served his country in the Army for 3 years, and soon after discharge was called to the service of our Lord. He faithfully preached the gospel in the Churches of Christ for more than 50 years, and loved to study, discuss, and teach others the word of God until the day he passed on to meet his Savior. Carl Sr. brought many souls to Christ during his ministry. 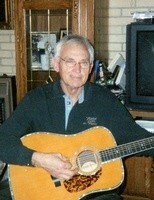 He was an avid gardener, beekeeper, and loved to play country and bluegrass music, and sang like Johnny Cash. He was also an avid weightlifter and body builder and mentored many young men in the area concerning physical fitness. He was preceded in death by his parents (Thomas and Balance), wife Patricia (Massey) and brothers Thomas and Kenneth. Survivors include his brothers Bobby and Ronnie, sisters Bonnie Brown and Susie Dyer, sons Carl Jr. (Sherrie) of Jonesboro, AR, Keith (Charlotte) of Prattville, AL, seven grandchildren, Jared (Samantha), Gareth, Will, Hannah, Camilla, Rachel, and Jacob; one great grandchild, Brooks. Arrangements are being handled by Neal Funeral Home, 231 N. Military Avenue, Lawrenceburg, Tennessee. The family will receive friends from 5:00 PM to 8:00 PM Tuesday, March 19, 2019 at Neal Funeral Home. Graveside services and interment with full military honors will be conducted at Shady Grove Cemetery at 1:00 PM Wednesday, March 20, 2019.